Hua To [Hua Tuo] was the first famous Chinese surgeon. 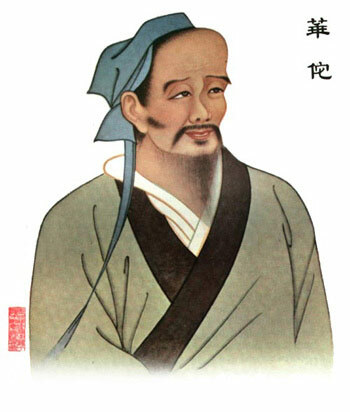 He developed the use of anesthesia, and furthered the limited Chinese knowledge of anatomy. Unfortunately, the tradition of using surgery was not carried on afterward (until Westerners re-introduced it), as there were apparently no books or direct disciples of Hua To to further the cause. When using acupuncture and herbs, he preferred simple methods, using a small number of acupuncture points and formulas comprised of only a few herbs. He practiced Chi-kung [Qi Gong] and taught the "frolics of the five animals," a practice still used today. His fame as a successful healer has led to his name becoming a brand name for Chinese medical products, such as Hua To Acupuncture Needles.